Biofuel pellet quality and physical properties testing. Biofuel pellet quality testing and analysis are available through Intertek biomass fuel laboratories located in convenient locations across the world. Fuel pellets are typically produced from wood, plant fibers, waste paper, and other sources. Fuel pellets can vary in quality, heat value, trace elements, and other factors. 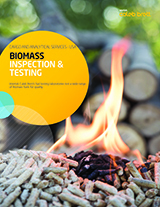 Biomass fuel pellet test methods include the gross caloric value of wood fuels. The ASTM E870 standard, along with additional ASTM and ISO tests for biomass fuels, are available.